As some of you may know, I've been a purposeful coin collector since I was 8 years old. Like so many kids back in the 1960's, I rifled through pocket change and piggy banks (while no doubt annoying my relatives and neighbors) hoping to fill empty slots in my Lincoln Cent album. I did find quite a few, but none of the scarce dates in the series. About the time I was old enough to drive, I landed a job in a grocery store and started setting aside a few dollars monthly with the goal to someday buy a truly rare key date coin. The 1909-S VDB cent was paramount in my dreams. Sometime in 1978, when I was 19 years old, I realized the time had come for me to do it. Oops, that sounds a bit open ended and nefarious, so let me clarify... the "it" I was referring to was to buy a special, rare date coin; I finally had sufficient funding to go for it. Of course, I initially leaned toward the aforementioned 1909-S VDB. My life would be complete with that hole in my album filled, I reasoned. But then I got to reminiscing about the Mercury Dimes my Grandma gave me during our Sunday morning drives when I was very small. I described those precious memories in a blog entry here. I recalled it was Grandma who first taught me about the elusive 1916-D Mercury Dime, once I got old enough to understand the concept of rarity. Maybe this should be my first really big coin purchase. I'm fairly sure Grandma had never held a 1916-D Merc before, though she had spent many years searching for an example. Seemed like a wise selection numismatically, with a heaping of emotional appeal. The absolute perfect choice. Wouldn't Grandma be delighted? While the addition of a 1916-D Mercury Dime was based on sound logic, what happened next was not. Bear in mind this was 1978. Grading was inconsistent and all over the map. The American Numismatic Association (ANA) was promoting a 70 point grading scale, but it was little heeded. What's more, third party grading/authentication companies had not yet been born, thus encouraging overgraded coins and fakes/alterations to saturate the coin market. There was but one merchant who had a 1916-D dime. 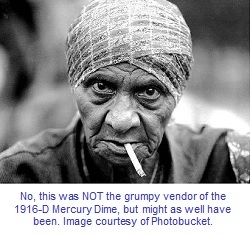 She had only a few coins alongside a truckload of old pots and shopworn trinkets, yet the kingpin of the Mercury Dime series was amongst them. It was labeled as AG condtion (About Good) with a selling price of $125. My heart started racing. Eureka, I found it! Putting on my best serious countenance, I meekly attempted to negotiate a better price. "Take it or leave it, sonny" grunted the crabby old woman, as she exhaled a massive puff of smoke in my face. As best I can recall, she resembled the woman above (Courtesy of Photobucket). Realizing what it must feel like to be a skinned cat, I plunked down the requisite $125 cash. My hands were shaking. With my new purchase in tow, I crawled out of that snake pit somewhat dazed and embarrased. Driving home, I had mixed emotions, mostly negative. Did I do the right thing in spending that much money for a dime? Why didn't I tell the rude vendor to stick it and walk away? Should my purchase be kept a dirty little secret? As I questioned my actions, never did it cross my mind that possibly I got stuck with a worthless doctored coin. I decided to share the news of my purchase with Grandma, intentionally omitting the sordid details of the retail outlet from whence it came. When it registered that she was in the presence of a 1916-D Mercury Dime, she bellowed loudly "Ay yi yi!" as was her wont (as her grandchildren will attest to). Thankfully, she didn't ask where I bought it. I'm not sure if Grandma was happy and too stunned to say much, or if she disapproved. All the more reason to cast a pall over the incident. Now that the heretofore most eventful day of my coin collecting career had come to an end, the special dime was safely hidden away. The years flew by, and along the way we lost Grandma in 1990, and Grandpa the year before. I imagine Grandma is up to her armpits in rare coins now, assuming they have money up there. As a coin collector, I continued to learn and mature. Being a numbers freak, I meticulously recorded selling prices for specific dates and compared them from year to year. By the mid 1990's, I gleefully noticed the AG 1916-D had risen in value to $225. By 2005, it was retailing at $475, and climbing fast. On a down note, I also became much more aware of how many so called 1916-D dimes were actually the product of fraudsters. 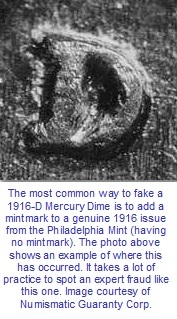 A widespread deception was to add a "D" mint mark to the common Philadelphia Mint 1916 issue. Thanks, NGC, for the photo at left. It was also possible it was a heavily worn 1916-S, being misrepresented as a coveted 1916-D.
All the coin experts recommended the best way to avoid being victimized was to "buy the book before the coin" and purchase only through reputable sources. 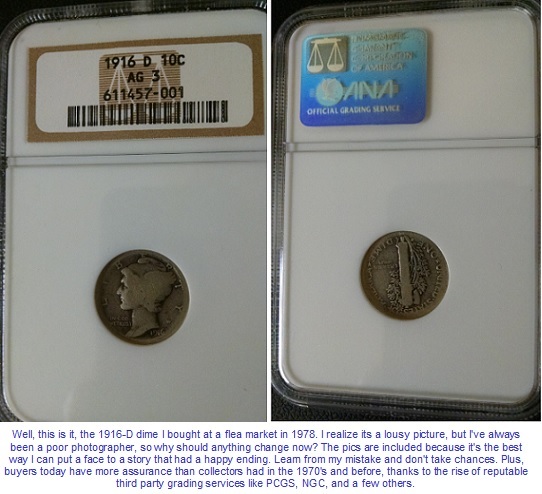 Since I violated these common sense tenets, I came to grow uneasy about the flea market coin and eventually convinced myself it was probably a fake. The odds seemed against me. Happily for collectors and dealers, Professional Coin Grading Service (PCGS) came along in 1986 and elevated the coin hobby to a higher level. They helped stabilize coin grading, and their subsequent "population reports" revealed new data to properly evaluate scarcity. For a fee, your coin would be professionally examined, and if authentic, assigned a point grade on the 70 point ANA grading spectrum. Problem coins, such as fakes, alterations, or cleaned coins, were returned with no grade. The Numismatic Guaranty Corporation (NGC) opened shop in 1987, providing the same service. These two companies are still around today, and are held in the highest regard by numismatists. Now back to my story. For a long time, I continued to fret over the coin. Yes, I tried to ascertain for myself its authenticity, but could never conclude with 100% confidence that it was real. Sometime around 2005, I think it was, I finally got sick of feeling this way, so I sent it to NGC for authentication and grading. It was time to put the uncertainty to rest, once and for all. A few weeks later, the coin came back. I hesitated to open the package. I was so sure I'd find a body bag inside (this is a slang term for a problem coin returned without a grade. The coin is housed in a soft plastic flip, hence the body bag connotation). For decades, I (sort of) relished the thought of owning a rare 1916-D Mercury Dime. Now, everything was about to go up in smoke. I prayed Grandma wasn't witnessing this shameful moment from above. Maybe she was preoccupied at a quilting party with some other angels, I hoped. By now, you are probably thinking the coin was not a real 1916-D dime, just as I was. Guess what? To my pleasant surprise, it was authenticated as genuine, grading at AG-3. Hooray! Instead of unleashing a string of expletives directed at the crabby flea market merchant (likely deceased by now) and her gullible customer, I breathed a sigh of relief, for I was reaffirmed as the proud owner of a rare, highly desired United States coin. Also, now that the coin was "slabbed" by NGC, I would have an easier path if I decided to sell at some point. Clearly, a WIN-WIN for me. Over the next few years, I observed with gusto as prices continued to soar for the 1916-D. By 2009, AG-3 examples were selling for around $650. Not that I purchased the coin strictly with investment in mind, but at that point in time, this computed to a compounded annual return rate of 5.46% over a period of 31 years. Not bragging, just sayin'. So here we are in 2015. Mercury dime key dates have come a bit off their all-time highs from six years ago. Nowadays, the retail price of an AG-3 1916-D Mercury Dime is around $550. This should not deter anyone contemplating the purchase of this remarkably significant coin. To the contrary, these lower prices are an opportunity to buy at a discount. We can be certain this little lady will gain steam once more as traditional demand realigns with a small fixed supply.
. I've coded the link to isolate 1916-D Mercury Dimes graded by PCGS or NCG. Get the best condition you can afford. [disclosure: if you click the link and buy something at eBay, I get a small commission, Yay!!!]. Be sure to buy only from someone who has a great feedback rating. There are a few shady operators on eBay, some of whom may sell counterfeit slabs and other ripoffs, but most of them do not hang around for long. 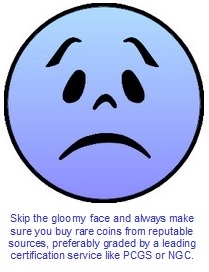 We have a Coin Buying Advice chapter with more tips to avoid getting hurt. Whatever you do, please DO NOT go to a seedy flea market looking for this or any other rare coin, as I did back in 1978. I deserved to get burned for being so stupid, but escaped harm. You may not be so lucky.